Sometimes it’s nice to experience something nice. Like when you’re riding the subway and someone drops one of their gloves on their way off the train and another person successfully stops the departing person and gives them the glove back; that small, temporary glow upon witnessing such an act that re-instills some faith in humanity. Erin Mallon’s play The Net Will Appear delivers a similar momentary respite from the battering harshness of the outside world, in a straightforward but skillful production directed by Mark Cirnigliaro. Seventy-five year old Bernard, played by Richard Masur (recognizable from the TV show Transparent, though also a forty-five year veteran of the stage), has a rooftop hide-away routine, where he sits in a folding chair and drinks “juice” (Jim Beam neat). 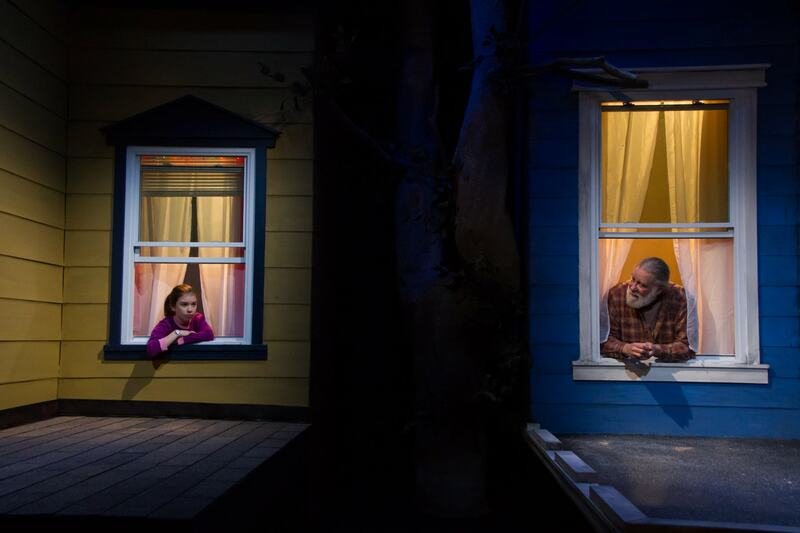 In the play’s opening scene, this space is exuberantly invaded by the appearance of his nine-year-old next-door neighbor Rory (played in the performance that I saw by a kinetic Eve Johnson) who climbs out of her bedroom window and pesters Bernard with a shower of queries. Eventually, Bernard is forced to abandon his turf, with round one going to Rory. In subsequent scenes, their semi-contentious relationship turns – as one might expect from the dramatic setup – into a deepening friendship, although the two never meet on solid ground. Like an old owl and a baby hawk, Bernard carefully tutors Rory in small ways from the rooftop, and Rory in turn enlivens Bernard’s otherwise solitary experience. Presenting first as somewhat Wes Anderson-like in tone and approach (precocious youth, chamber music interludes, formal staging), The Net Will Appear relaxes into itself and finds a unique sweet spot between the world-weariness of Bernard and the spit-fire crackle of Rory’s desire to be seen (and heard) by all. The production takes on the risk of casting both roles with actors who are within a few years of the actual age of their character, and for the most part the gambit succeeds. Eve Johnson’s Rory is a posturing, speed-talking delight, and if Mallon gets a little too much mileage over having her say dirty words (which gets a dependable chuckle each time), she also finds a number of detailed moments in which to demonstrate how Rory is learning about the world through language and how her seemingly over-advanced adult linguistic skills are more a result of mimicry than precocious mastery. Richard Masur’s portrayal of the grumpy almost-alcoholic Bernard is less variable, but then again, this is not Bernard’s play. He’s mostly there to listen and to offer occasional sage (or not so sage, depending) advice. The play is so much Rory’s that in order to temporarily shift the focus, Mallon is compelled to provide Bernard with an otherwise uncharacteristic demand for attention, having him shout “CAN I TALK, KID?” at one point. This utterance then allows him to reveal something of himself, which involves a child lost too early and a shut-in wife whom he is losing, degree by degree, to dementia. The action of the play sometimes feels like it’s in a cinematic split-screen as it’s difficult to hold both Bernard and Rory in the same visual frame. This is compounded by the requirements of staging, in that both characters have a limited range to prowl, each confined forever to their rooftop, only able to dart in and out of the windows. (Rory frequently appears in a new costume, sometimes within a single scene.) The overall effect is static, yet there is something calming in its predictability. Both Rory and Bernard will always be there, until one day they’re not. Eschewing the obvious descriptors (heartwarming, quirky, tugging at heartstrings, etc. ), I’d describe my experience of the work as peaceful. An unlikely friendship unfolds and that’s mostly all that happens – the stakes remain relatively low, and neither character is put in significant danger. Yet by putting actors of appropriate ages on stage, Mallon gives us an uncommon opportunity to relish the study of contrasts. I was like that one day, and in another thirty years, I might be like that. The play never tries to bridge the gap between rooftops, although there is one point in which Rory threatens to hurtle her way over. Instead, we watch as one seemingly fixed point (Bernard) is acted upon by an erratic burst of laser-point energy (Rory) until he can’t help being moved – and neither can we.